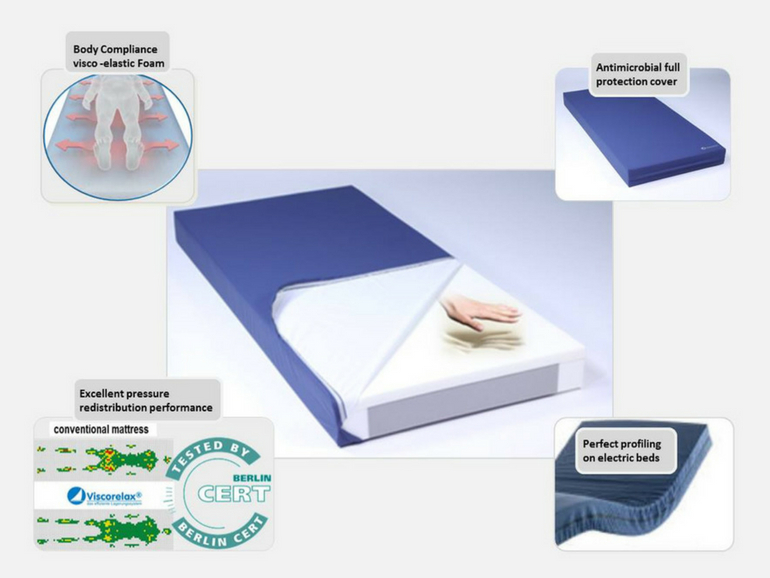 The Viscorelax® Therapeutic Mattress is designed for users considered to be at High Risk of pressure ulcer development are used in hospitals, elderly care and home care environments for the prevention and treatment of pressure ulcers up to grade 3 according to EUPAP and for pain therapy VAS 5.
points responsible for skin breakdown and pressure injuries. 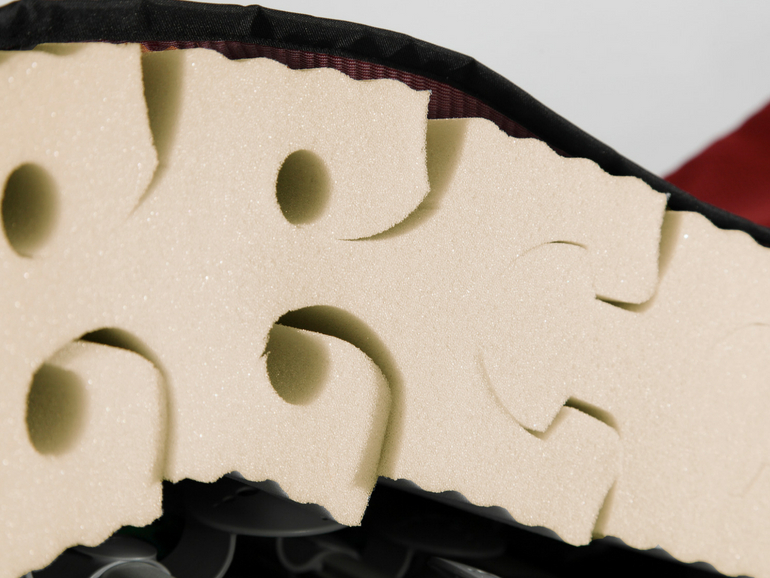 The open-pore CMHR foam base offers stability and support, enhancing longevity. The combination of these particularly air permeable and breathable foams reduces heat accumulation and provides for optimal body climate. 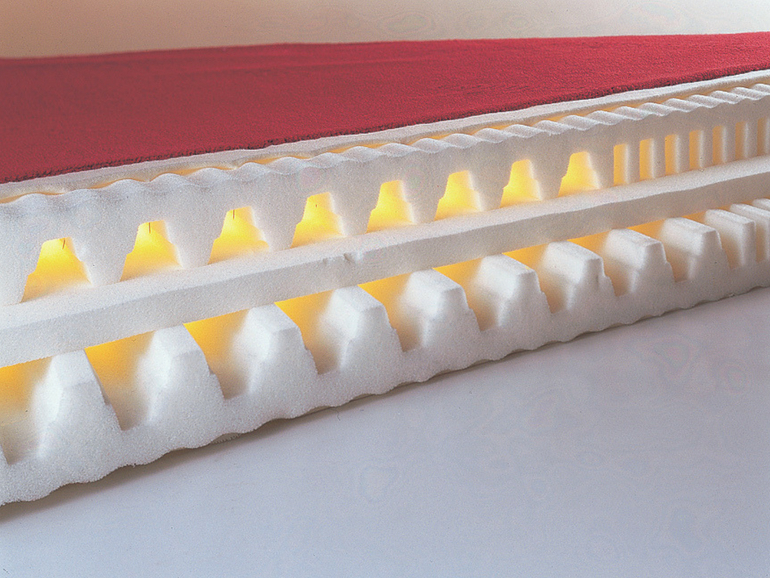 The Viscorelax® Therapeutic Mattresses also profile perfectly on electric beds. 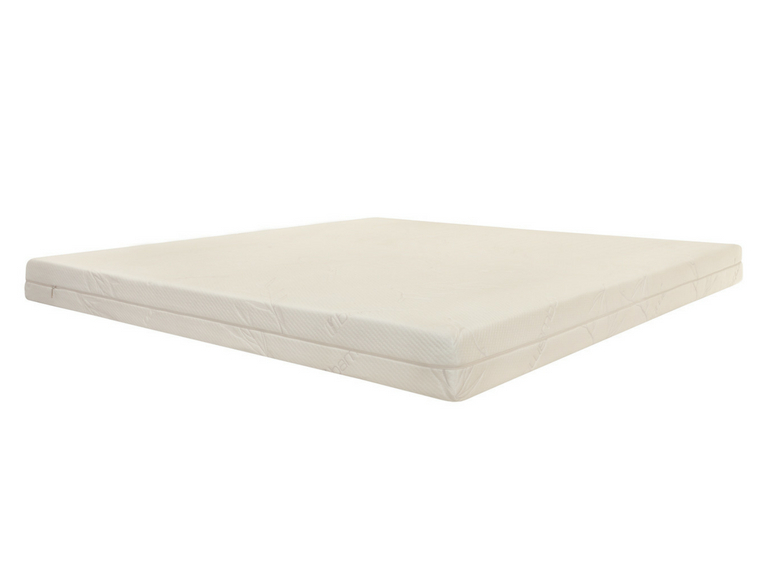 All Viscorelax® Therapeutic Mattresses are supplied with antimicrobial total protection covers (Sanitized®). 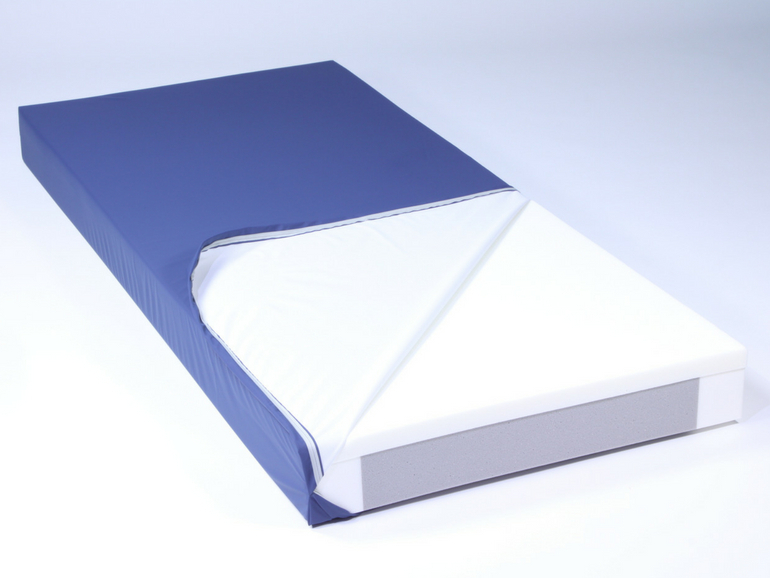 The PU-covers are multi-stretch, waterproof, vapour-permeable to improve patient comfort and maintain skin integrity by reducing shear and friction forces whilst aiding infection control. The Viscorelax ® Sure mattress has all of the same qualities as the Viscorelax Therapeutic Mattress similarly aimed at High Risk users. It also has reinforced edges to ensure stability during patient repositioning, facilitate kinaesthetic mobilization and safe transfers. 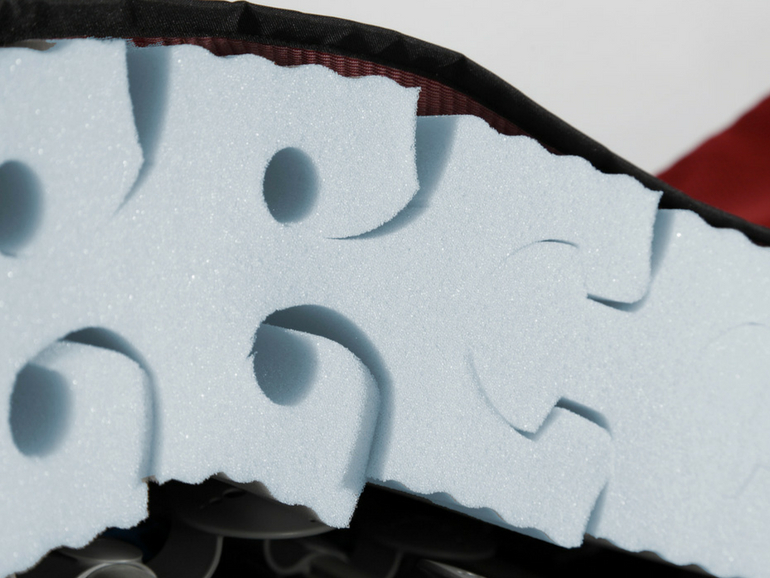 The Viscorelax ® Sure mattresses are made of visco elastic foam in the super structure and of high-quality open- pore polyether foam in the sub structure. This is it particularly breathable and fully breathable. 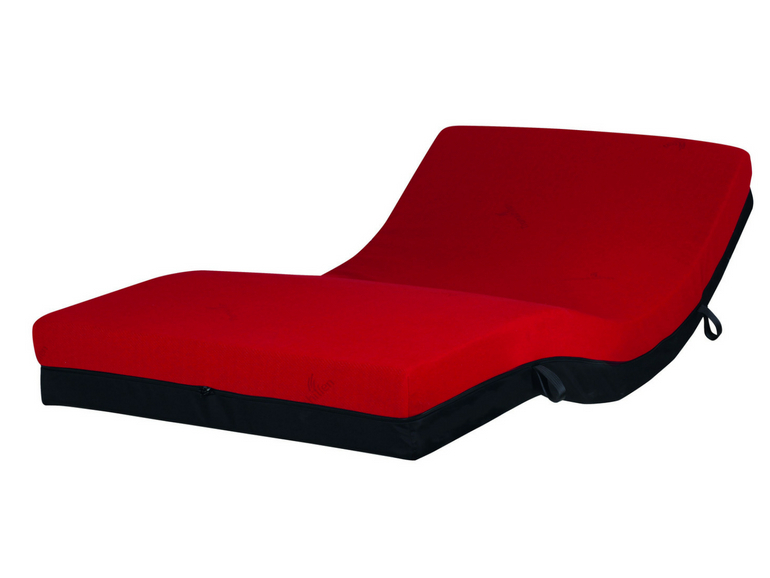 The viscoelastic foam reduced by the contours just sinking the hammock effect, provides for an optimum pressure relief and a functional support of the spine. 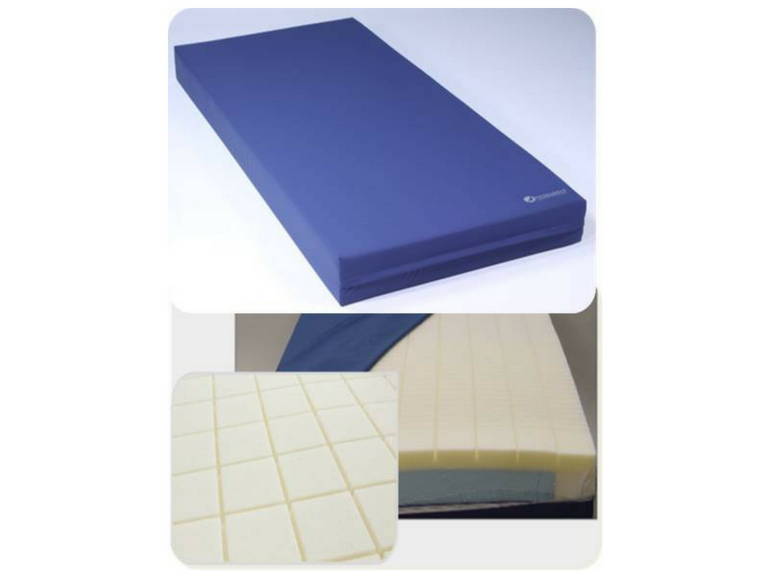 Clinic mattresses for decubitus and pain therapy with antimicrobial full protective cover for support in hygiene management. 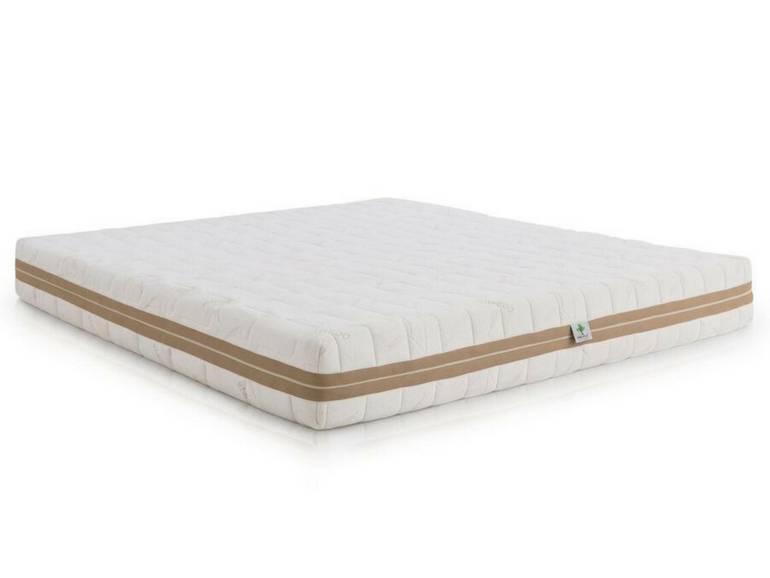 The Viscorelax® Multi-Zone – Comfort Plus Therapeutic Mattress feature ergonomically adapted multi-zones of different profiling to offer the highest lying comfort and support alongside excellent pressure distribution. They are suitable for users considered to be at High Risk of pressure ulcer development and are used in hospitals, elderly care and home care environments for the prevention and treatment of pressure ulcers up to grade 3 and for pain therapy VAS 5. 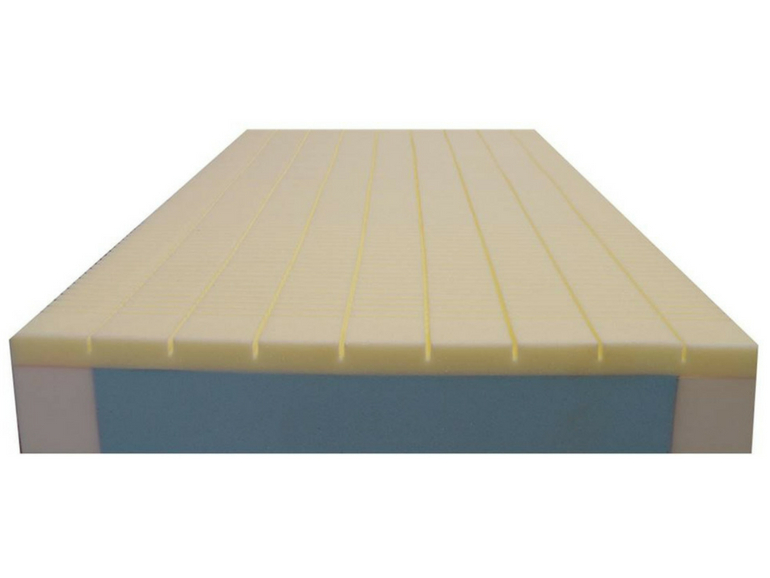 Viscorelax® Multi-Zone – Comfort Plus Therapeutic Mattresses feature a high quality visco-elastic body compliance foam at user interface with unique thermoactive qualities to re-mould perfectly to the body shape and redistribute weight across the entire surface. The body compliance foam provides comfort and excellent pressure distribution thus eliminating pressure points responsible for skin breakdown and pressure injuries. 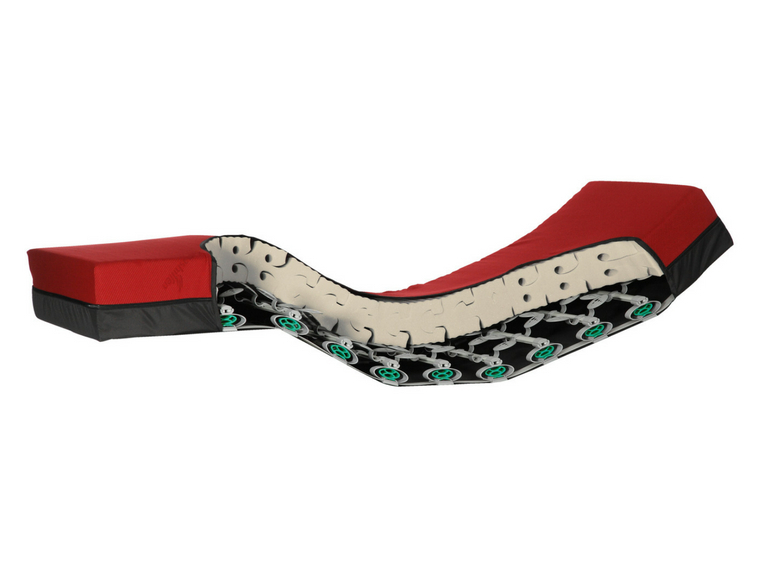 The oen-pore CMHR foam base offers stability and support, enhancing longevity. The combination of these particularly air permeable and breathable foams reduces heat accumulation and provides for optimal body climate. 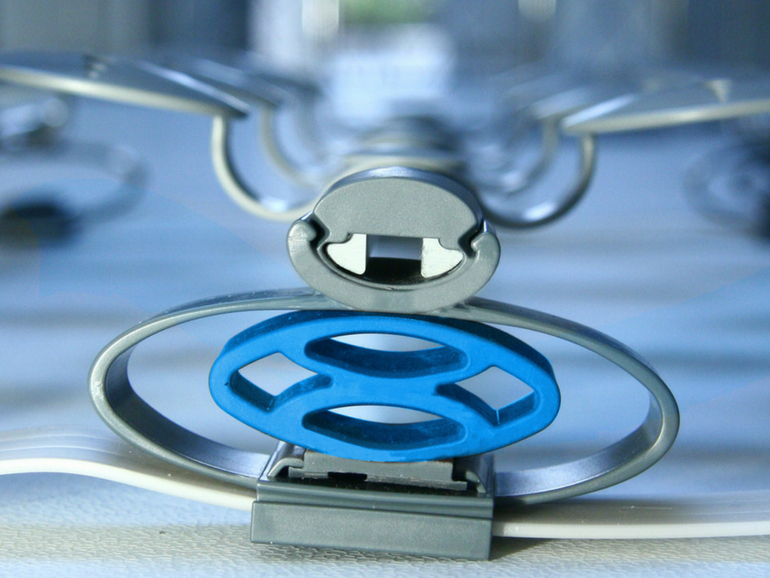 The reinforced edges ensure stability during patient repositioning, facilitate kinaesthetic mobilization and safe transfers. 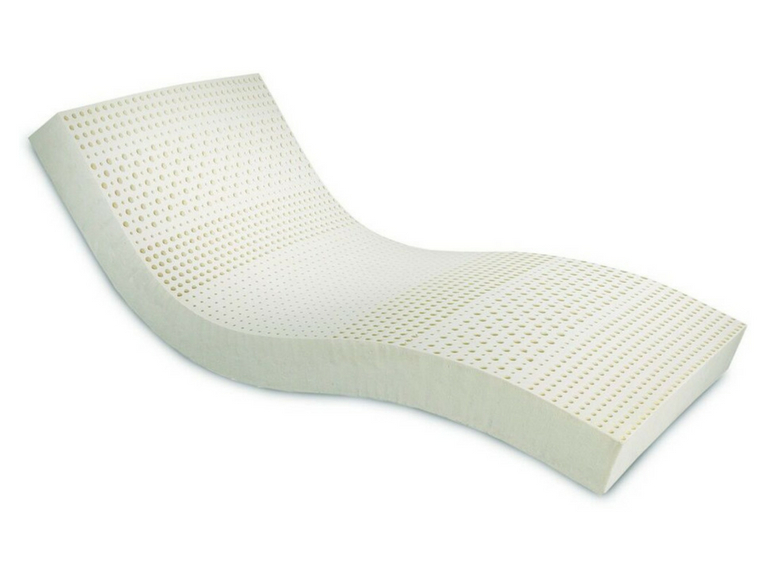 The Viscorelax® Sure Mult-Zone Therapeutic Mattresses profile perfectly on electric beds. 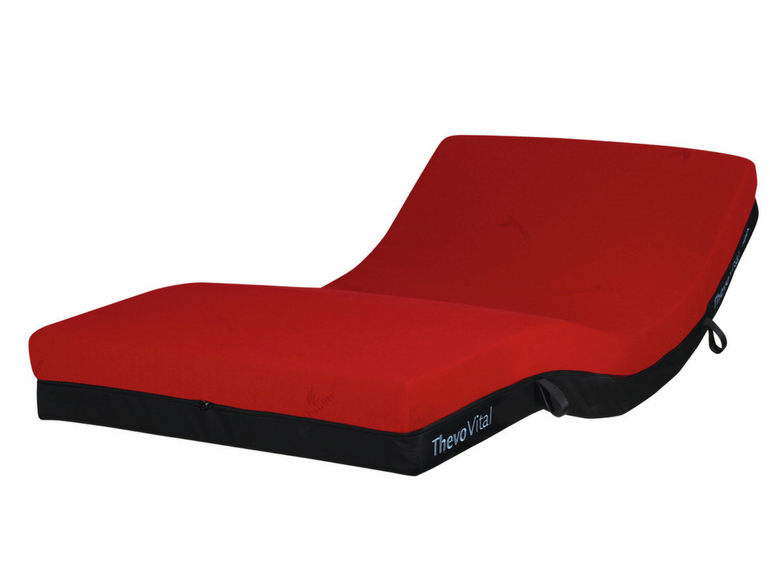 The ThevoautoActive Pressure Care Mattress prevents and treats pressure ulcers up to and including Grade 3 EUPAP. Conventional positioning systems are either too hard or too soft for some patients, causing skin irritation to develop into pressure ulcers. 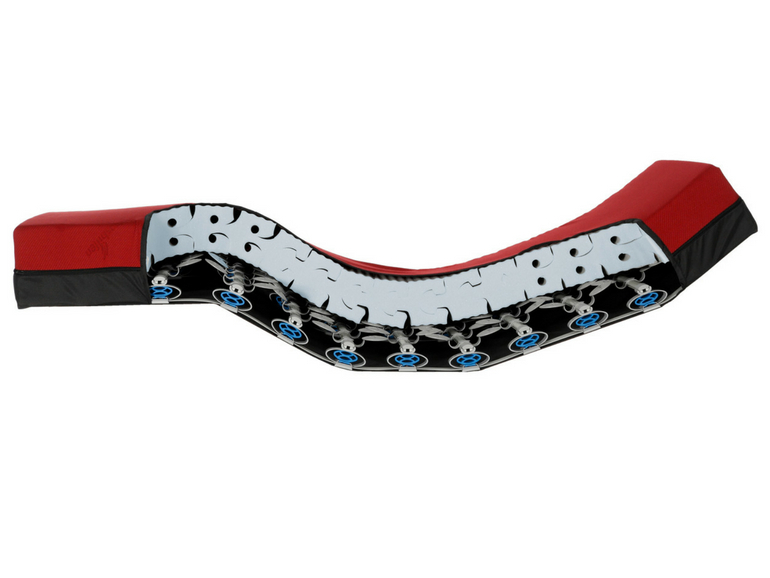 Thevoauto Active Pressure Care Hospital Bed Mattress provides pressure-relieving stimulation without electricity, using Integrated MiS Micro-Stimulation® wing suspensions. The pressure relief mattress is designed with special air channels that ventilate the skin and provide maximum comfort. Choose from an Incontinence Cover that’s breathable and cleans easily by wiping down with a disinfectant, or choose the breathable microclimate Jersey Cover. The ThevoVital Dementia Mattress allows patients a more restful and deep slumber throughout the entire night, with less sleep disturbances. MiS Micro-Stimulation® gives small counter movements with each movement of the patient, improving body perception and blood flow. Older patients and special needs patients will find this especially important for recuperative sleep. A deeper sense of security leads to less roaming and moving throughout the night, which results in less irritability and better health. 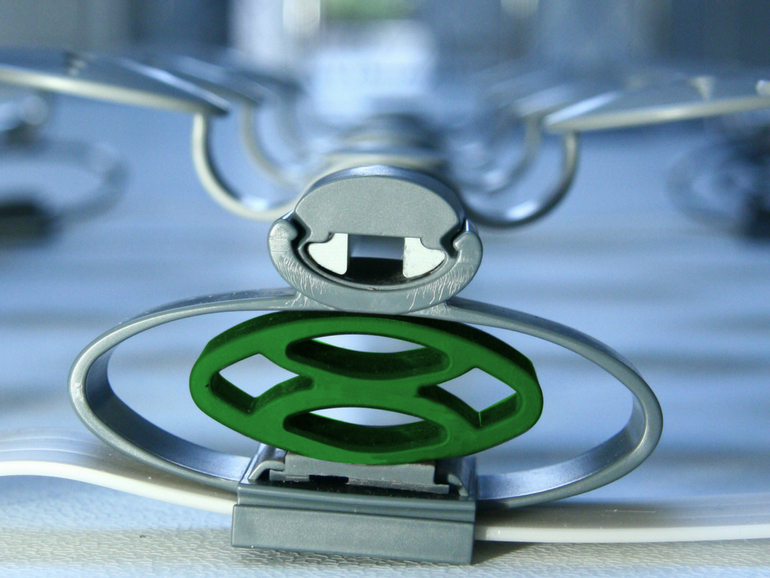 The construction of the ThevoVital mattress is based on the patented concept of the MiS Micro-Stimulation: Specially arranged wing springs promote the own movement of the body and contribute towards continuously supplying the brain with sensory information. If this information is missing especially with dementia afflicted patients an “internal restlessness” with sleep disorders is the immediate consequence. With ThevoVital the already dramatic restrictions in the quality of life of dementia afflicted patients become at least noticeably reduced for the duration of the sleep. It also results in a much more alter daytime experience for the user and and more managable one for the carer. The ThevoVital Dementia Mattress can be used in a home or care environment and is available with a washable jersey or incontinence cover. 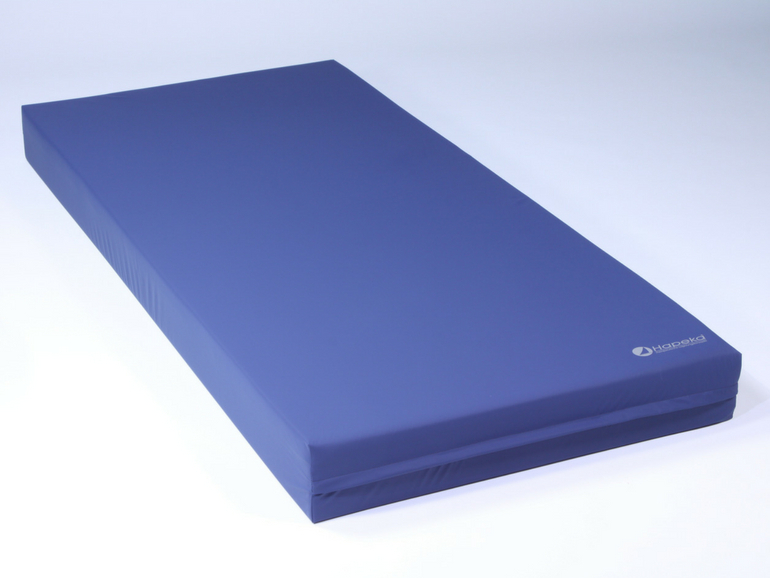 The ThevoCalm Parkinson’s Relief Mattress is specially designed to provide Parkinson ‘s disease sufferers with a firm yet comfortable and highly effective sleeping surface. 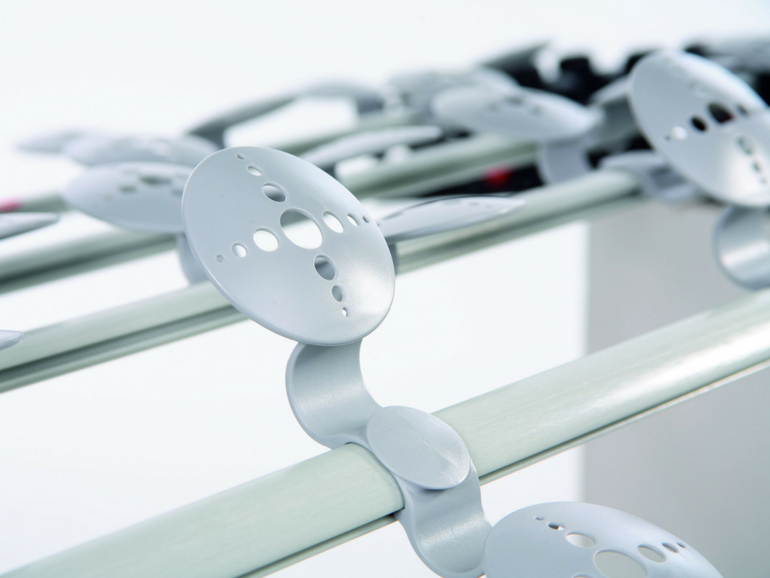 Made with Thomashilfen’s patented MiS Micro-Stimulation® technology, the ThevoCalm’s suspension framework produces miniature counter movements to help ensure a peaceful night’s rest. By relaxing the user’s muscles and diminishing restlessness, the ThevoCalm Parkinson’s Relief Mattress is able to reduce the negative daytime side-effects associated with Parkinson’s, including diurnal sleepiness and lethargy. The principle behind it is very simple: Integrated wing springs respond to the smallest pressure changes of the body and direct these back nearly unnoticed as micro impulses. Through this body perception and orientation are improved and one reclines more gently peacefully. If you normally wake up often at night, on the therapy mattress you fall asleep again faster. In the morning you are at last able to start your day without stiff joints and pain. Clinical tests, but also extensive positive feedback from care facilities and ThevoCalm users confirm the effectiveness of the concept: The patients sleep better through the night and suffer less from the symptoms of their diseases. “Undesirable effects” do not occur – quite in contrast to the numerous accompanying symptoms that the otherwise necessary medication sleep therapies bring with them. 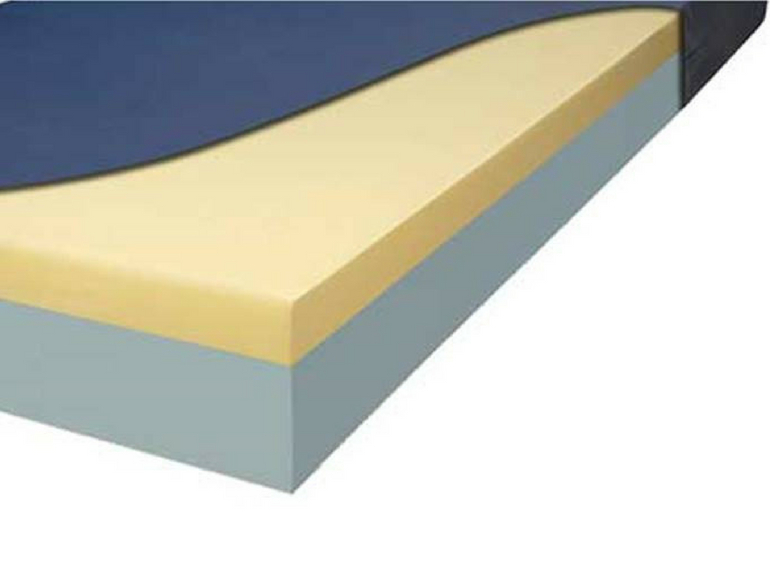 If your needs are low to moderate care, a standard latex mattress may be suffice. Natural Latex mattresses are 100% spring free and designed to give you the perfect night’s sleep by contouring to your unique body shape and reducing pressure points across your body. Suitable for all types of sleepers. 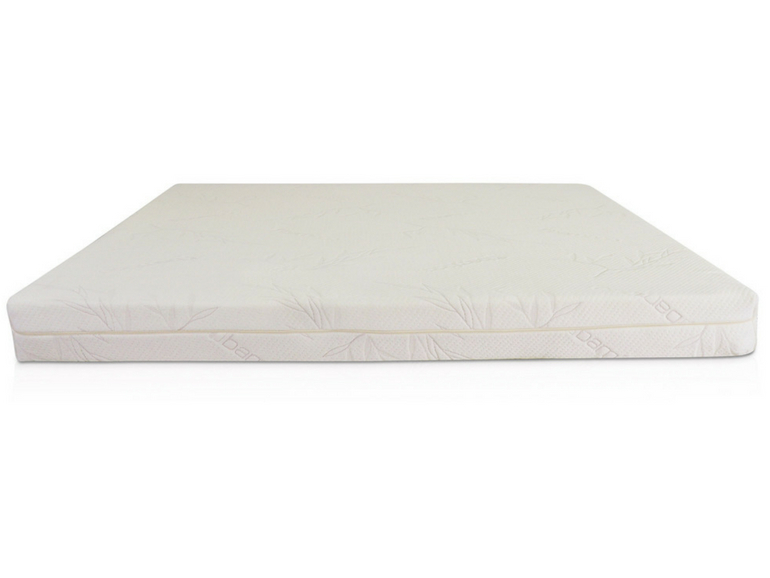 We stock both Natural Latex and Organic Natural Latex Mattress.